The Crier is the the keeper of the list of towne residents, and their addresses. The Crier calls out events and happenings in the towne and flogs the Sherwood Towne Crier rag. Who was in charge of assigning lots, setting easements, making new land. Who settles all disputes and has final say in all matters in the Towne. Who can answer all questions about towne policy and is the drafter and keeper of the rules of the towne. Who is the drafter of the towne guide and chronicler of the history of the towne and its people. Who takes care of the good looks of the townsite and all the construction of its folk. Christy, student in Anthropology, studies our community in its most primitive form! ColdBeer, creator of one of Alphaworld's most popular bars! Dataman, a.k.a Russell Freeland, editor of the New World Times! 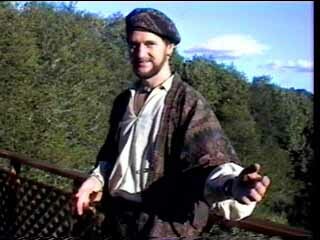 BlackThorne a.k.a Doug Goodier, who also lives in ALPHAWORLD at 8557n 8549.5w and on his great Web Site! Mayor a.k.a Lynn Macias towne mayor and resolver of all disputes! NetGuy, Alphaworld's unofficial police chief! Laurel who built a most wonderful English/French Herbalists Garden and Shopppe! Land Manager, building the community cabin and the first word in zoning! Towne Manager, a.k.a our Webmaster towne manager and keeper of the rules! Sherwood Towne Crier, Bruce Damer, who hawks and hustles to get folks to visit! © 1996 Contact Consortium, All Rights Reserved.